For upmarket mid-sized and luxury vehicles. Auto Bild (issue 10/2011) has published part 2 of the "Super Summer Tire Test 2011". The test size was 205/55 R16, test vehicle VW Golf. Rating for the ContiPremiumContactTM 2: "recommended"
The ACE (Automobil Club Europa) has published its Summer Tire Test 2011 for the size 205/55 R16 V. Test vehicle was a VW Golf VI. Rating for the ContiPremiumContactTM 2: "Testwinner"
The eagerly awaited results of the summer tire tests carried out by leading motoring organisations in Germany, Austria and Switzerland have now been published. 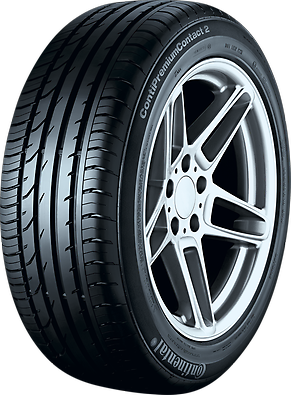 These reveal that the ContiPremiumContactTM 2 in the size 185/65 R 15 was rated as 'highly recommended'. Rating for the ContiPremiumContactTM 2: "highly recommended"
The ContiPremiumContactTM 2 earned top marks in the first summer tire test of the year by AutoZeitung magazine (5/2010 issue, February 2010). Tested size was 205/55 R16 V. Test vehicle was a Mercedes C-Class. Rating for the ContiPremiumContactTM 2: "Test winner"
The test editors praised the product's refined structure, which demonstrated high grip and safe brake performance on both wet and dry asphalt. In their summary, the experts noted the "superior wet properties" and "top dry performance" of the Continental tyres. The editors tested ten products in all in the 205/55 R 16 V size class, used for a variety of compact and mid-sized passenger cars. Competitive products with low rolling resistance once again suffered multiple weaknesses in braking on wet roads. 3D grooves optimise braking performance in both wet and dry conditions. The even pressure distribution ensures very short braking distances. Due to an increased number of tread blocks and an open inner shoulder, water is dispersed more efficiently. The harmonious round shape of the ground contact patch provides excellent protection against aquaplaning. The asymmetric tread pattern stiffens the tire shoulder and provides optimum road contact.